(by Daniel Halper, NY Post) – Ford has slammed the brakes on a plan to invest millions of dollars in a plant in Mexico and will instead upgrade a Michigan facility, crediting the move Tuesday as a “vote of confidence” in President-elect Donald Trump’s pro-growth agenda. Ford CEO Mark Fields announced the U-turn at the Flat Rock Assembly Plant in Michigan, saying Trump’s [pro-growth tax and regulatory reform] policies were critical to the decision. “We believe these tax and regulatory reforms are necessary to boost US competitiveness,” Fields told workers there. The automaker canceled plans to build a $1.6 billion plant in San Luis Potosi, Mexico, and will spend $700 million to upgrade its Flat Rock plant and create 700 jobs to make electric and self-driving cars. Fields, in an interview on CNN, said the company changed its plans as as a strategic business move, betting that electric cars will eventually leave gas-powered cars in the dust. “We didn’t cut a deal with the president-elect,” he insisted. “We did what’s right for our business, first and foremost. That’s what drives us in every business decision that we make. Last month, when Fields declared that Ford was looking to work with the incoming administration, he suggested that it was too late to change the plan for a new factory in Mexico. Ford still intends to move production of its Focus compact car to an existing plant in Mexico. The Focus is currently made in Wayne, Mich.
Bill Ford, the company’s executive chair, spoke with Trump, who during the presidential campaign repeatedly slammed Ford for moving US jobs to Mexico. After the election, Trump phoned Bill Ford to discuss the company’s plan to move manufacturing of the Lincoln MKC sport utility vehicle to Mexico from Louisville, Ky.
Trump’s campaign pledge to bring jobs back to America has proven to be more than a vow. In December, air-conditioner-maker Carrier agreed to remain in Indiana after talks with Pence. That decision also saved about 700 jobs that would have ended up in Mexico. 2. What was Ford going to do? What will they now do instead? 3. For what reason(s) did Ford make this decision? 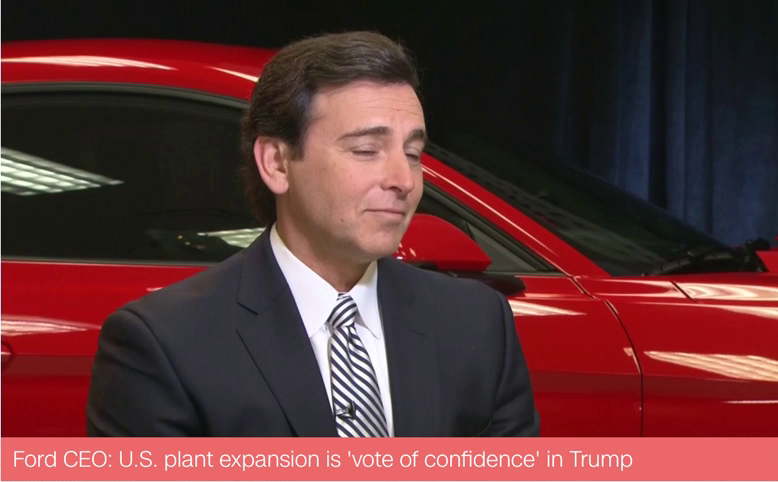 – How did Ford CEO Mark Fields explain the decision? 4. How did President-elect Trump react to Ford’s announcement? 5. How did Vice President-elect Mike Pence react to the news? 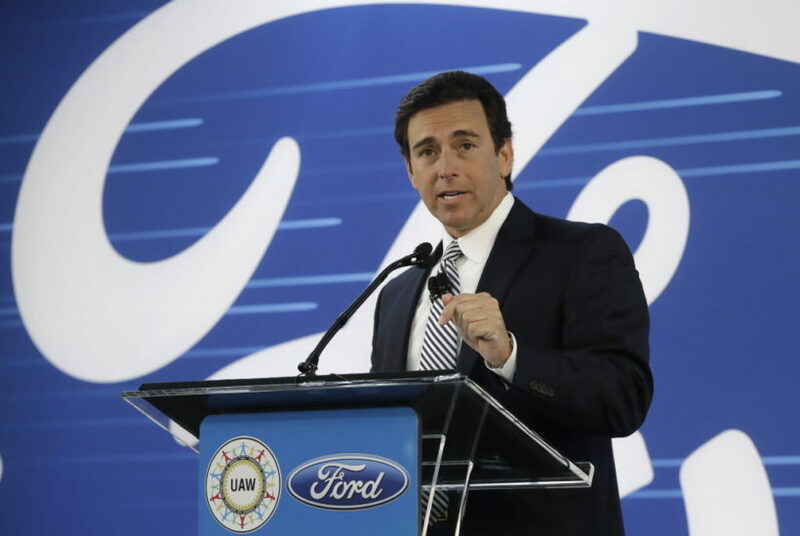 Ford Chief Executive Mark Fields said the decision to cancel the new plant in Mexico was in part related to the need to “fully utilize capacity at existing facilities” amid declining sales of small and medium sized cars such as the Focus and Fusion. Fields also endorsed “pro growth” tax and regulatory policies advocated by Trump and the Republican led Congress. A Ford source said the decision was influenced by Trump’s policy goals such as lowering taxes and regulations but there were no negotiations between Ford and the Republican over the decision to cancel the Mexico plant or invest in Michigan. a) Ask a parent or grandparent: Do you think Trump’s economic policies (regulatory and tax reform policies) will improve the economy? Please explain your answer. b) Watch the CNN interview with Ford CEO Mark Fields under “Resources” below. The Ford news was the latest in a string of pre-inauguration successes for Trump in the manufacturing sector. In early December, air conditioner and furnace maker Carrier agreed to stay in Indiana after weeks of negotiations headed by Pence. The decision reportedly saved about 700 jobs that would have been shifted to Mexico. Later in the month, wireless provider Sprint and Internet company OneWeb announced they would be adding thousands of jobs in the U.S. Both companies are controlled by SoftBank founder Masayoshi Son, who had previously met with Trump. Earlier Tuesday morning, Trump took aim at another auto giant: General Motors. “General Motors is sending Mexican made model of Chevy Cruze to U.S. car dealers-tax free across border. Make in U.S.A. or pay big border tax!” Trump tweeted. GM, however, quickly pushed back on Trump’s assertions. “GM builds the Chevrolet Cruze hatchback for global markets in Mexico, with a small number sold in the U.S.” a statement said.